Newly-designed models offer innovation, Tier IVA emission systems, and factory auto-steering capability. The new MT500D Series high horsepower tractor lineup from Challenger boasts some of the most innovative thinking in the market today, with Tier IVA compliance, factory auto-steer, capability, and a tough continuously variable clutchless transmission. 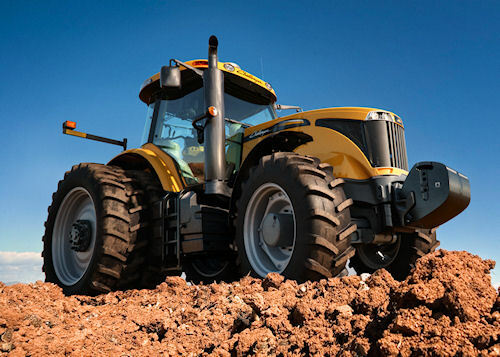 Four newly-redesigned models from 170- to 225-horsepower of the Challenger MT500D Series make up Challenger's high horsepower wheeled row crop tractor offering for 2012. Powered with engines from 175 to 225 engine horsepower (6.6L to 7.4L), the MT500 Series uses selective catalytic reduction clean air technology for improved emissions, minimal maintenance and high fuel economy. That power moves to the ground through the TechStar CVT transmission which is rated for 1,200-hour service intervals and directs the engine through a Power Management system that continually monitors load, speed and fuel economy. An AutoPower VI partial-powershift transmission is also available as an option. The Series can be outfitted with System 150 auto-steering technology and the AGCOMMAND telemetry system which provides real time tractor performance information to keep operations moving smoothly throughout the work day. A redesigned hydraulically-suspended cab offers more driver visibility and comfort, while a 114-gallon fuel tank and 11-gallon Diesel Exhaust Fluid tank allow longer periods of operation between refueling. For more information on the new Challengers, visit www.challenger-ag.com.